The other half of the dynamic duo working with Dr. Mathis is Stacey Reisdorph, a master’s student at the Ocean Acidification Research Center (OARC). From Iowa, Stacey has come a long way since her first time at sea on a Disney Cruise in 2009 as she immerses herself in the world of chemical and geological oceanography in the waters off of Alaska. Starting off studying early childhood and elementary education at the University of Northern Iowa, Stacey soon learned that her passions lay elsewhere. With the encouragement of her family and a fantastic geology professor, Stacey became a geology and earth sciences double major and had found her passion. When it came time to apply to graduate school, Stacey fulfilled her dream of moving to Alaska when she was accepted into a master’s program in glaciology at University of Alaska-Fairbanks. However, Stacey soon decided that she wanted to do something a little different and found a new home with Dr. Sam VanLaningham who suggested she start working with Dr. Mathis on a new and very exciting project in Glacier Bay. After a little bit of bouncing, Stacey found a home in the Mathis Lab at OARC in January 2011 and is quickly becoming a chemical oceanographer as she delves into the water chemistry of Glacier Bay, a treasured National Park and home to many whales, sea lions, and otters. Working closely with the Park Service, Stacey heads to Glacier Bay once a month to sample a series of stations for dissolved inorganic carbon, alkalinity, oxygen isotopes, nutrients, dissolved oxygen, total suspended sediments and particulate organic carbon. 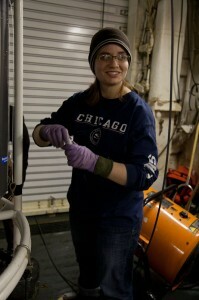 Stacey is adding water sampling data to a time series of CTD data that has been collected since the early 1990s. Glacier Bay is of particular interest because with climate change there is an increase in glacial meltwater entering the ecosystem leading to changes in the water chemistry. Glacial meltwater is low in alkalinity and therefore decreases the ability of the water to buffer against acidification. With this valuable time series of data, Stacey hopes to understand the dynamics and circulations patterns of the water from the mouth of the Bay to the freshwater sources throughout the year.